The need for a bottle to carry and make your protein drink is a necessity and a convenience for most. Protein shakes are popular among fitness enthusiasts as well as among those who need to supplement their daily diet. 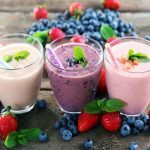 In order to give the body the required amount of protein that often remains inadequate in the daily diet, many doctors and nutrition experts propose protein shakes. Protein supplements are required not only for bodybuilding but also to bolster health. Many people who are trying to lose weight also are recommended to have protein supplements. These drinks help to replenish the nutrient-deficient diets that most people are on when they are trying to lose weight. The right kind of health supplement drinks helps to speed up the weight loss process as fat is burned and protein as well as essential minerals are supplemented in the body by such drinks. 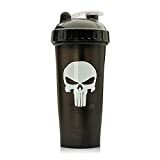 Protein shakers help to keep protein powders moisture free; the powder does not get lumpy or get moist when carried around in a protein shaker; it is necessary to invest in a protein shaker that would help preserve the powder or the mixed drink in an airtight manner. 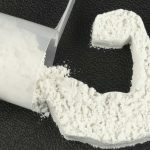 The design of protein shakers should be such that the supplement powder should mix with the liquid that is added to it. There should not be remnants of the supplement powder lying at the bottom of the shaker bottle. Every bottle found on the market comes with certain features. There are airtight qualities, mixing features, separate compartments for carrying powder and drink and so forth. Again, the outward design also matters to many. Hence, the design, durability and other functionalities are some aspects that differentiate one protein shaker bottle design from another. 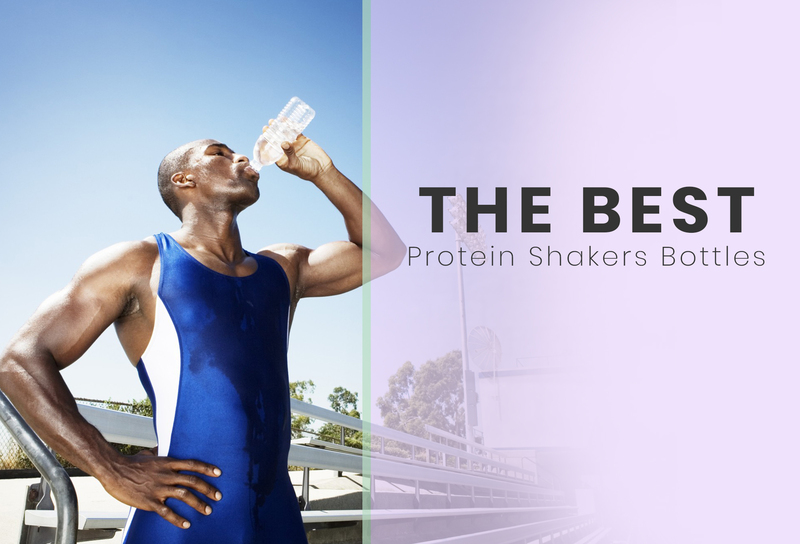 In the section below, we review the top ten popular protein shaker bottles, their features as well as pros and cons. These details will help customers to make an informed choice at the time of choosing a shaker bottle to carry their fitness drink around. This is a shaker bottle produced by a successful brand in the market. There are five different variants offered in this product range, each having characteristics of their own: Classic, Insulated, ProStak, Radian and Pro32. This is a shaker bottle that promotes sturdy and durable features along with space for extra storage. Those who need to consume pre as well as post workout drinks will find this shaker bottle design adequate. There are different kinds of superhero or character logos to choose from. Hence, to make a unique statement or flaunt your love of the comics or the characters, this is a perfect accessory to opt for. The ProStak bottle design of the reputed Blender Bottle brand offers several features. It is rich in functionalities as well as comes with stylish designs that appeal to most customers. 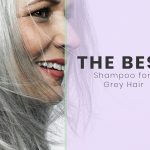 This particular bottle design adds to the joy for the users due to several convenient features it offers as well as the handsome design that it comes as. 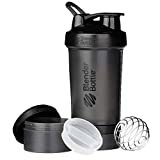 This particular design among the different shaker bottles that BlenderBottle provides offers several unique options. The bottle comes in several colors. There are several special features that make it a premium and handsome accessory to have for those who like to hit the gym in style. The main unique feature of this bottle is the dual capacity. The shape of the bottle is such that the bottom is rounded, making it easy for any supplement powder to blend into any drink easily. This shaker bottle design of SmartShake brand offers certain beneficial features such as being able to carry extras around for those who need pre as well as post workout supplements. Love a shaker bottle that has a military look and feel? This protein shaker bottle stands apart from the others of urban and contemporary styles due to its unique design approach. This is a shaker bottle produced by a successful brand in the market. There are five different variants offered in this product range, each having characteristics of their own: Classic, Insulated, ProStak, Radian and Pro32. Each of the bottle design flaunts unique features and offer distinct advantages that make sense to different customers. The bottle design shown here is that of the Classic design. There are 27 color variations to choose from that makes the choices several for any customer. Hence, any combination is not too hard to find with this bottle design, whether you wish to pair a colorful lid with a plain body design or vice versa. Among other features that this bottle offers, the increment markings on the container’s side are another handy aspect. This helps one to know the ratio of supplement powder to add besides the liquid they need. The blender bottle is designed to carry about 28 ounces, but it comfortably holds 20 ounces. This is convenient as most protein or health food powder supplements are measured out in such doses. To make it further convenient, there are three sizes to opt for which are 20, 28 and 32 ounces. The average size bottle is something that suits most regular protein shake drinkers. Other convenient and handy features include a leak-proof design; a wire whisk that is made of 316 surgical steel, optimizing shaking and mixing inside the bottle. The lid flips up conveniently when one is drinking and does not shut over the nose of the drinker. This is a shaker bottle that promotes sturdy and durable features along with space for extra storage. Those who need to consume pre as well as post workout drinks will find this shaker bottle design adequate. There are two compartments that can be screwed onto the bottom of the bottle; these can carry powder or liquid 5.4 and 6.75 ounces separately. Hence the containers can help a user to carry extra protein powder or supplement as they require for their workout sessions. The bottle also comes with a pill storage tray of 3 sections. This can be removed and attached and fits into the removable section of the bottle. The bottle is designed to hold 21.5 ounces of any liquid. The shaker also comes with a household whisk designed mixer. This attaches to the lid and that makes it easy to keep track of. This particular shaker bottle is designed for the DC Comics fans. There are different kinds of superhero or character logos to choose from. Hence, to make a unique statement or flaunt your love of the comics or the characters, this is a perfect accessory to opt for. 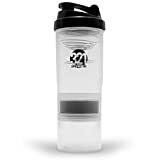 It would certainly make one’s style stand out when they hit the gym with this shaker bottle. It also comes with a unique shaking mechanism, the Actionrod shaker. This comprises of a rod that has sliding loops attached. The ProStak bottle design of the reputed Blender Bottle brand offers several features. It is rich in functionalities as well as comes with stylish designs that appeal to most customers. There are a total of 26 colors of this range of bottle to choose from. Each bottle is designed to hold drinks to a maximum amount of 22 ounces. The measurement markings on the side of the bottle go up to 16 ounces only. The storage options offered by ProStak make this range of shaker bottles unique of this brand. There are two separate containers that are provided with the bottle, one of 100cc and the other of 150cc capacity. Each comes with lids that can be screwed on and attached to the bottom of the ProStak bottle. The other option also exists, that of only carrying the bottle without the containers. With the containers built with screwable lids, these can be used apart from the bottle as well. These can be used to carry pills, protein powder separately and can be screwed onto the bottom of the bottle as and when required. The mixer BlenderBall made of surgical steel ensures that any drink is mixed well and easily in the bottle. It also comes with a leak-proof guarantee. This particular bottle design adds to the joy for the users due to several convenient features it offers as well as the handsome design that it comes as. 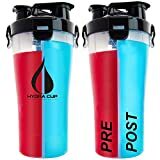 Those who are into fitness or sports and need to carry different kinds of supplements and make them on the go will find this particular shaker bottle designed to be convenient. The liquid storage capacity of the bottle is about 18 ounces. There are two compartments that are included besides a section for pills. The bottle can also be opted for the larger size that is capable of holding 20 ounces. There are three storage containers or compartments available in the larger size along with a pill section. The compartments screw onto the bottle’s bottom and hence they are easy to carry around. They are also made of sturdy designs and can be used separately as well. Another unique feature is the carabiner that is found on the side of the bottle. The shaker bottles for travelers have this handy feature; this allows one to strap it to a backpack or hang the bottle accordingly. The carabiner provides the only hold on the bottle. 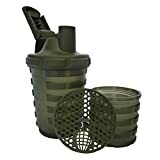 This particular design among the different shaker bottles that BlenderBottle provides offers several unique options. The bottle comes in several colors; the choices are 29 in total that is much more than the classic series of this brand. The color span is varied for the SportMixer as well as size options. Users can opt for 20 or a 28-ounce bottle as per their need. Many users of plastic based shaker bottles complain of the smell of the last drink remaining in them. That is something that is prevented in this particular series of shaker bottles of this reputed brand. The bottles of SportMixer range are odor resistant as well as stain resistant, built of a unique plastic material, the Eastman Tritain technology. 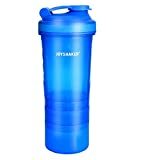 The other features beneficial of this shaker bottle design are that it comes with a rubberized grip. This makes the bottle easy to hold onto, as one mixes and consumes their drink on the go. There is a carry loop design that can make this shaker, double as a bottle for carrying water. The measurements are written on the sides of the bottle help in knowing the exact ounce of a drink being carried around. There is the BlenderBall of surgical stainless steel material that comes included with the shaker and ensures that any drink mixes perfectly. The lid design could be tricky to figure out and needs to be closed right to make it leak proof. Some users have complained about the powder getting stuck in the grooves found on the inner surface of the lid. The bottle is also dishwasher safe that is a distinct advantage. Looking for a shaker bottle that is as rich in features as it is in design? Then the Hydracup of the Dual Threat series is worth looking at. There are several special features that make it a premium and handsome accessory to have for those who like to hit the gym in style. The main unique feature of this bottle is the dual capacity. There are two sides of 14 ounces – each equal 14 ounces that build up to 28 ounces in total for carrying drinks of such capacity. Each side also comes with a separate flip lid; hence two separate drinks can be carried in this bottle in style. For those who are serious about their workout drinks and indulge in a pre and a post workout drink, this particular bottle would be ideal for carrying both. The combinations can be endless in this cup; you could also add ice in one container and your protein drink in the other. That would help to keep the drink cold and would not allow the ice to dilute the drink at the same time. Its other features include different colored lids, color combinations of cups with catchy phrases printed on them. One can even combine the bottle with two different colored flip lids that would help to identify the two different drinks easily. 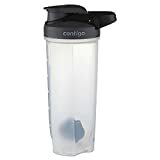 If you love shaker bottles that come with a transparent design, you will want to opt for this particular shaker bottle from Contigo. Designed for convenient mixes to be made and consumed on the go, this particular shaker bottle has several unique features as well. The shape of the bottle is such that the bottom is rounded, making it easy for any supplement powder to blend into any drink easily. There is a separate compartment provide at the bottom that makes storage of supplement powder convenient. There are two servings of protein powder that can be held in the container. The bottle comes with a leak free design and has a handle for ease of carrying around. The bottle contains a mixer ball of heavy plastic that proves inconvenient for some users. It has also been found that the supplement powder gets stuck in the ball’s grooves as the bottle is shaken for mixing drinks. The mixer ball can also prove difficult to clean. 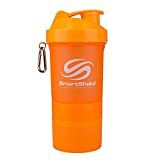 This shaker bottle design of SmartShake brand offers certain beneficial features such as being able to carry extras around for those who need pre as well as post workout supplements. There are storage options for carrying pills and extra supplement powder as well. The shaker bottle comes with two separate containers for storage. These can be screwed on or taken off; same for the pill tray. There are choices of bright colored designs of this shaker bottle series or one could opt for the regular black shaker bottle design. It is also possible to choose compartments of different colors apart from the cup. Hence, one could choose their unique combined shaker bottle that can serve several purposes. The bottle is designed to hold about 20 ounces, but the measurement markings etched on the sides of the bottle are only up to 12 ounces. This can be a limitation as most users need to whisk and consume drinks about 20 ounces. Some users have also complained of odors that remain in the bottle after use and storage. Love a shaker bottle that has a military look and feel? This protein shaker bottle stands apart from the others of urban and contemporary styles due to its unique design approach. The shaker has been modeled after a hand grenade and that can definitely turn heads as you carry it around. The snap lid also resembles the clip present on a grenade. There are four color options that this bottle comes in among which the classic one of Army Green is a distinct favorite. This protein shaker bottle is about 20-ounce capacity. Even though it flaunts a unique design the standard features are also assured in this bottle design. However, the rounded grenade like the design of the bottle can make it difficult to carry around. It also would not easily fit into a car’s or a backpack’s cup holder as other shaker bottles do. The special features make it unique; however such as the storage space included in the lid’s top which can store capsules or pills. There is also a storage cup included in the bottom section which proves convenient when storing protein powder. As is evident from what is shown above, there can be different kinds of shaker bottles to opt for. Hence, users can choose as per their need, usage requirements as well as design preferences. 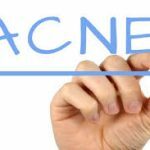 However, there are certain features that make a difference when choosing such a product. That includes durability and safety of usage – whether one is storing drinks in the bottle for long or needs to carry it around, keep it in extreme cold or store hot drinks in it. One can also decide on other features that they wish to have in their shaker bottle, for instance storage compartments or a larger bottle size that can make a drink of the right capacity. The above options showcased are reliable products that are made keeping in mind requisite safety standards and norms. Hence, one can choose as per their personal requirements as well as among the different features on offer among the different brand products out there in the market.